Riding nearly 3 million pounds of thrust, the Ariane 5 lifted off from a launch pad nestled on the northeastern shore of South America at 2134 GMT (5:34 p.m. EDT; 6:34 p.m. French Guiana time). The Ariane 5’s on-board guidance computer commanded the rocket’s twin solid rocket boosters to swivel their exhaust nozzles, steering the launcher toward the east from the Guiana Space Center, a European-funded, French-managed spaceport near Kourou, French Guiana. The rocket’s solid-fueled boosters, primarily manufactured and prepared by affiliates of the Italian company Avio, burned out and jettisoned less than two-and-a-half minutes into the flight. The Ariane 5’s nose fairing, built by Ruag Space in Switzerland, dropped away from the launcher around a minute later. Status callouts from the space center’s range operations manager indicated the Ariane 5 flew right on course as it headed over the Atlantic Ocean. The Ariane 5’s French-made core stage Vulcain 2 main engine shut down and separated around nine minutes after liftoff, and the German-built HM7B upper stage ignited, consuming a mix of liquid hydrogen and liquid oxygen for around 16 minutes to place two communications satellite — named DSN 1/Superbird 8 and Hylas 4 — into an elliptical geostationary transfer orbit. After arriving in in orbit, the Ariane 5’s upper stage released the Japanese DSN 1/Superbird 8 satellite around 28 minutes into the mission. A few minutes later, the rocket jettisoned a composite structure to reveal Hylas 4 for separation. Arianespace confirmed deployment of the Hylas 4 communications craft around Plus+34 minutes. Moments later, Arianespace chairman and chief executive Stephane Israel declared success. Thursday’s launch from the edge of the Amazon rainforest came a little more than two months after an Ariane 5 rocket deployed two commercial communications satellites into an off-target orbit. Investigators probing the erroneous launch determined coordinates programmed into the Ariane 5’s inertial reference units led the rocket approximately 20 degrees off course from its intended easterly trajectory seconds after liftoff Jan. 25. The rocket performed as programmed, but the incorrect navigation input caused it to place its two satellite payloads — the SES 14 and Al Yah 3 communications satellites — into an unplanned orbit. 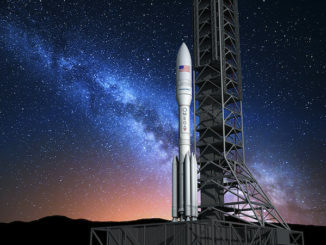 The spacecraft will make up for the orbit shortfall using their on-board fuel, but it will take longer than planned to place the satellites into commercial service. For details about the investigation into the Jan. 25 launch anomaly, see our earlier story. Arianespace said the cause of the trajectory deviation during the Jan. 25 launch was “perfectly understood and corrective measures clearly identified.” The recommendations were “immediately implemented,” Arianespace said, and will be applied to future Ariane 5 flights, beginning with Thursday’s mission. The Jan. 25 anomaly ended a streak of 82 consecutive flawless Ariane 5 flights dating back to 2003. Arianespace continued its 2018 launch campaign with the successful March 9 liftoff of a Russian-built Soyuz rocket from French Guiana carrying four commercial O3b broadband satellites. 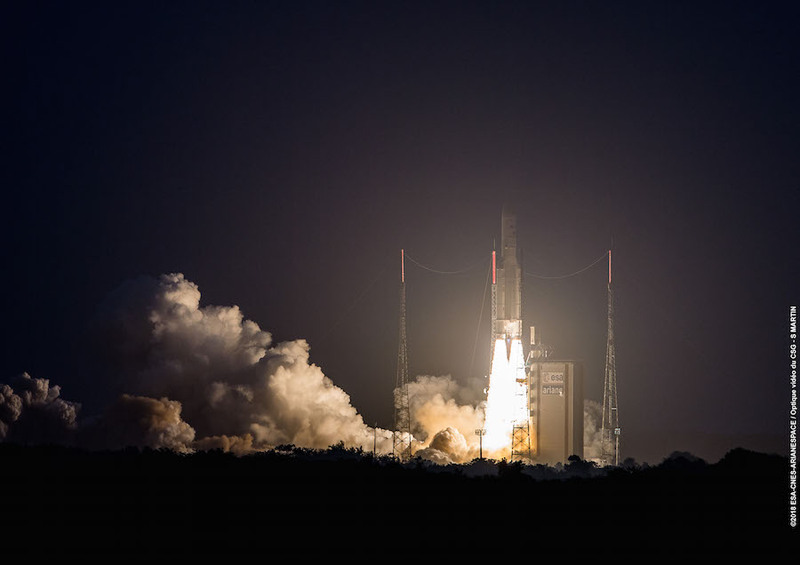 The Ariane 5 rocket launched Thursday aimed to release the DSN 1/Superbird 8 communications satellites in an elongated orbit ranging between 155 miles (250 kilometers) and 22,236 miles (35,786 kilometers) above Earth, with an inclination of 3 degrees to the equator. U.S. military tracking data published late Thursday indicated the Ariane 5 reached an orbit close to the pre-flight prediction. Built by Mitsubishi Electric Corp. under the contract management of NEC Corp., the DSN 1/Superbird 8 satellite has a dual mission for commercial customers in Japan and the Japanese Ministry of Defense. The commercial part of the satellite’s payload, known as Superbird 8, will provide Ku-band an Ka-band communications services in the Japanese market for Sky Perfect JSAT Corp., replacing coverage currently provided by the aging Superbird B2 satellite launched in 2000. The rest of the satellite’s telecom capacity, operating in X-band frequencies, will be employed by the Japanese Ministry of Defense through a commercial provider named DSN Corp., a subsidiary of Sky Perfect JSAT. The Japanese military’s first dedicated communications satellite, known as DSN 2, launched on an H-2A rocket in January 2017. 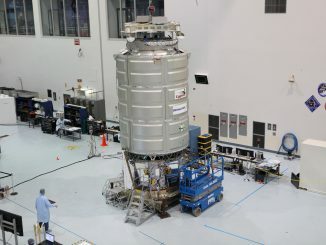 The 11,790-pound (5,348-kilogram) DSN 1/Superbird 8 spacecraft was supposed to launch on an Ariane 5 rocket in 2016, but the satellite was damaged during its transport to the launch base from Japan aboard a cargo plane. The satellite was returned to Japan for repairs. Also known as Kirameki 1, the Japanese telecom relay craft will enter service in the next few months. The Hylas 4 communications satellite, built by Orbital ATK, will provide high-speed broadband services across Europe and Africa. Owned by London-based Avanti Communications, Hylas 4 will provide connectivity to mobile network operators and Internet providers, and beam high-speed services to civilian and defense users in governments. Hylas 4 joins two other satellites in Avanti’s network, and the newest addition is set to double the company’s broadband capacity, according to David Bestwick, Avanti’s chief technology officer. The new spacecraft carries 64 fixed Ka-band beams that can reach Avanti customers in Europe and Africa. Four additional steerable Ka-band beams aboard Hylas 4 can also provide coverage over Europe, Africa and South America. 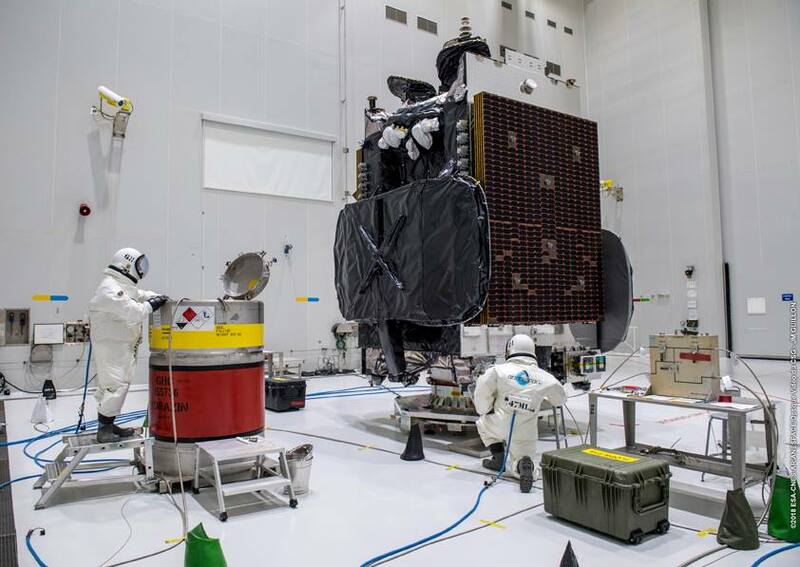 In addition to the two satellites it owns, Avanti leases Ka-band capacity on an SES-owned communications satellite, and plans to launch another broadband spacecraft on an Ariane 5 rocket in 2019 in a public-private partnership with the European Space Agency. The 8,928-pound (4,050-kilogram) satellite is based on Orbital ATK’s GEOStar 3 spacecraft platform. It carries a hydrazine-fueled thruster to conduct five major orbit-raising burns over the next 10 days, followed by the extension of the satellite’s power-generating solar panels to their full span April 15. Testing of the Hylas 4 satellite’s Ka-band telecom payload will begin April 19. Both satellites launched Thursday have missions expected to last at least 15 years. Arianespace’s next mission is scheduled for May 25, when an Ariane 5 rocket will place into orbit the Indian GSAT 11 communications satellite and Azerspace 2/Intelsat 38, a television broadcast spacecraft shared by Azerbaijan’s national satellite operator and Intelsat.